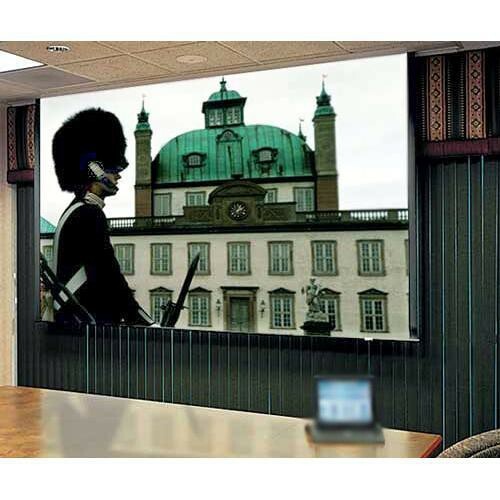 Draper 72.5x116" Ultimate Access/Series E Motorized Projection Screen - What if you know that you want a ceiling-recessed screen, but you don't know what projector (or projectors) will be used---and therefore, you don't know the optimum size or aspect ratio of the screen, the optimum screen surface, or whether tab tensioning is required? With the Ultimate Access, that's not a problem; order the case now---just make sure it's large enough to accept the largest screen you think you may need. Order the screen later, after the projector decision is made. Or let the occupant make the decision at a later date. What if technology changes? What if a new projection format is introduced, or Draper introduces a superior new screen surface? With the Ultimate Access, that's not a problem; it's quick, easy and comparatively inexpensive to replace the screen in an Ultimate Access, with no extra electrical or ceiling work. What if you're planning a facility and the room design is flexible, or the presentation rooms have not yet been determined? With the Ultimate Access, that's not a problem; install an Ultimate Access case in each room during construction, and think about screen selection later. Adds great value to the facility. An independently motorized ceiling closure - in its closed position, the motorized closure forms a solid bottom panel, giving the ceiling a clean appearance. Your audience will be impressed by its precision timing and quiet, fluid movement. Depending on surface, available in sizes through 12 x 12' and 15' NTSC. Box Dimensions (LxWxH) 155.0 x 15.0 x 15.0"